How do you know if you have enough to retire? Depending on your circumstances, your SUM180 Plan may not have gotten into whether you have enough to retire, or whether you WILL have enough to retire when you choose to do so in the future. That is because we at SUM180 believe that we should help you focus on the next few steps you need to take in your own journey to feel confident of your financial picture, wherever you are. We do not automatically “skip ahead” to where you stand on retirement like practically all other services do. Having said that, if you want to explore where you are relative to future retirement, below we outline how to use the data you entered in your interview to determine that. You can easily access that data by opening up your Interview in the My Data section of the SUM180 Dashboard. Fair warning, this will be like one of those “story problems” from your childhood that you either loved or hated. If you hate story problems, just stay focused on your next steps and over time you will get where you need to be. If you are taking out a fresh piece of paper right now, excited about this story problem, have at it. Everyone’s circumstances are different, of course. 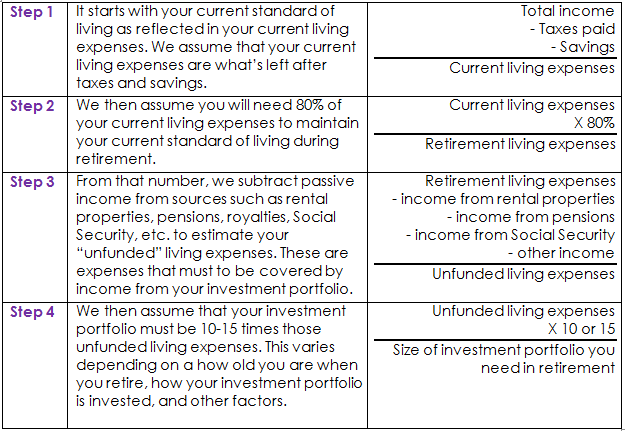 Obviously, we don’t know your specific plans for the standard of living you want to have in retirement. However, experience has taught us that people naturally scale back a bit in retirement. A rule of thumb is that retirement expenses will be 80% of your current expenses. You can see that you can easily increase or decrease that percentage to explore your own situation. I write more about this in my post Your Retirement Will Look A Lot Like Your Life Before Retirement. As you work through this, you will see that other sources of income, besides Social Security, make a big contribution to your financial picture during retirement, and reduce the required size of an investment portfolio needed to support your retirement living expenses. Every bit of income helps. I always had the feeling that I wasn’t doing enough. Working through my SUM 180 interview forced me to actually collect all the data from my various retirement accounts and look at the numbers. That made me feel better – knowing the actual amount of money my husband and I have saved so far. Looking at the details also encouraged me to max out my Roth contributions – so the numbers will look even better when I do my 2015 taxes in February. I did the same thing with a Roth when I got my plan — had not even started one before. I’m curious: It sounds like you did not elect to do this calculation? I mentioned above that we really don’t want to put this calculation in front of people until they want it. What are your thoughts on that? Thanks for the formula. Now that I have tackled my Sum180 plan of reducing debt I find myself focusing more energy on retirement. While I wish I had more to put into the retirement bucket I appreciate Sum180’s approach of tackling the first steps first. As I say it is about progress not perfection.